We are in the process of securing status as a registered Alternative Education Provider. We hope to begin projects in the new year. Get in touch for more info or feel free to drop by for a tour of the premises and discuss what’s on offer. We run ASDAN and City and Guilds accredited qualifications. 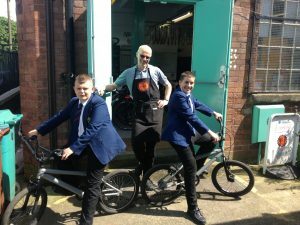 Below is Paul with come school aged kids and young people, supporting them through bike maintenance workshops.